That's pretty much in order from back to front, and goes a long way to explain why my right arm is so sore again today. I should have called the chiropractor's office last week to book an appointment for today, and I didn't, and now I am sorry. 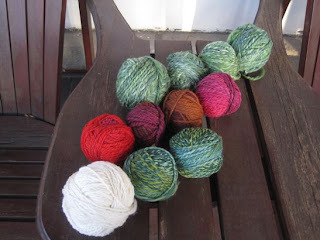 And at the same time: glad to have so much handspun waiting for the skein, Soak, dry stage. The four colourful balls in the middle are the first installment of the Twisted Fiber Art club for this session. I ordered an 'evolution' this time instead of my usual self-striping option, which is why it seems to be four balls of unrelated yarn. When I get it all assembled, it will shift gradually into each new shade. Ouch. I bought this because some previous Fleece Artist merino from a kit had been the most wonderful spinning experience, back when I was using a spindle. I don't know what was different this time: wheel? months of squashing in a crowded drawer? fate, laughing at me? whatever: it was agony to draft out. My arm got really sore doing this. 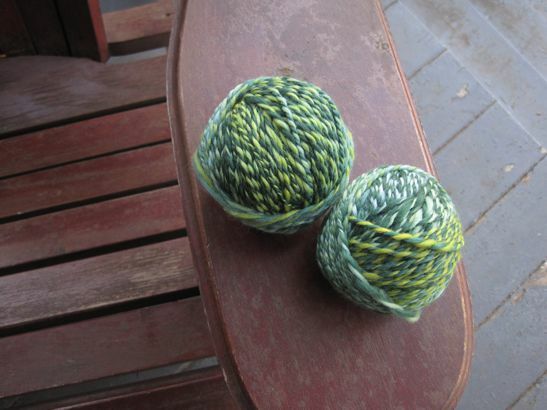 On the upside, I am quite fond of the yarn I got. Maybe I can knit a sling? After that experience I was faced with resting my arm or getting back into the saddle, and decided to turn to my trusty old undyed Polwarth from Ashford, of spinning wheel fame. Of all the spinning I've done, it's this which forms the most peaceful spinning experience I can get on tap. It's lustrous to look at and cozy to hug, it smells sweet even after washing and knitting and washing it again, and it seems to go on forever because I bought 300g of it for a grand total of $15 and have barely made it through the first 100g, even now. Plus: it looks as fluffy as buttercream icing. This fiber was definitely easier to draft out, even at the same tension as the blue-green Fleece Artist. 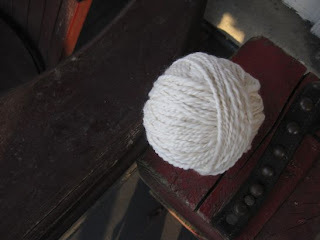 After a while a friend sat down beside me and I made him squish the unspun fiber to see how amazing it was. He immediately became concerned I was ruining it by spinning it, because yarn is never as soft as this stuff is. So when I pulled this ball together I tracked it down and made him squish it. Ha! It's just as fabulous as it was before. And now I have to go sew the button on a little present I'm giving later today. One down, two to go, of the presents I ran out of time to knit before Christmas. Go me! And as you've learned- every bump, every braid, every batt is different. Even if it comes from the same store, the same seller, the same sheep. It's part of the excitement and adventure, no?